Not long after LG announced its new G family of tablets, the 7-inch LG G Pad 7, which is the smallest of the bunch, popped up on AnTuTu's radar. The device carries the code-name LG V400 and doesn't have much to boast with in terms of raw specs. The tab runs on a quad-core Snapdragon 400 CPU clocked at 1.2GHz, has 1GB RAM, 8GB of storage memory, a 1.3MP front camera and a 3.2MP main camera. The display resolution is 1280x800. All of this adds up to a fine entry-level 7-inch tablet, but we're yet to learn two very important details - pricing and battery life. 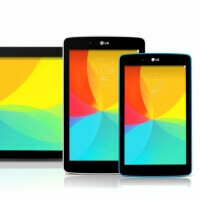 Hopefully, LG will give the G pads an affordable price. The G Pad series succeed LG's last-year 8.3-inch G Pad, which is still a good buy in this time and age - especially if you can snag it on a clearance sale before your retailer has started selling the new tablets. The G Pad features a Snapdragon 600 CPU, 2GB RAM, and was updated to Android 4.4.2 KitKat last month. Is this a midrange tablet? I don't see how snapdragon 400 can run smoothly especially with LG's skin on top of it. You mean LG slim is smooth lol. Yeah that's what we were missing, another 100$ tablet that they'll most likely try to price at 180$. dude people pay 700-800$ for S5 or other flagships that worth 200$ and you're complaining about 80$?! Considering the Motorola G retails for about that much, I wouldn't consider that such a bad thing. I think it should really retail for about $150 if they want to be competitive and not infringe on Nexus 7 territory. I can assure you that adreno 305 works awesome@720p. It can easily play most intensive games in play store. I expect that 8.0 and 10.1" will be different than this. Today make something worst than 8.3 will be crazy. Snapdragon 400 will be used for 8" and 10". I bet $5 buck! Jk, save your money and wait for Galaxy Tab S/Nexus 8. Might as well spend $120 more and get a OnePlus One.